what is the origin of Vijayanagar Rulers , Major claims are kannadigas and Telugu, Let us see the facts. Muslim historians and scholars of the time such as Ziauddin Barani, Isarni and Ferishta and foreign visitors like Ibn Batuta and Nuniz also recorded that the brothers were serving the King Prataparudra and were made captive after the fall of Warangal. According to another historian who based his research on evidence culled from inscriptions such as Gozalavidu record, "the founders of Vijayanagara were at first in the service of the last Kakatiya king Prataparudra of Warangal, and that when that monarch was defeated by Muhammad bin Tughluq and taken prisoner, they fled to Kampili and took refuge in the court of Kampilideva” . On the outbreak of a rebellion in Kampili the brothers were sent by Tughlaq with an army to Kampili to reconquer it from the rebels and rule the province as his deputies. They successfully accomplished the task but under the influence of Vidyaranya they renounced Islam, and threw in their lot with the Musunuri Nayaks who had just then succeeded, under the leadership of Kaapaya, in expelling the Muslims and re-establish the national independence. Harihara and Bukka then reverted to their ancient faith and having declared independence, assumed the leadership of the Hindus of Kampili in their fight against the Muslims. Inscriptions prove that Harihara I and Bukka Raya I were in t he Hoysala service a decade before their arrival at Kampili (in modern Bellary district). Not only did the widow of Hoysala Veera Ballala III participate in the coronation of Harihara I in 1346, her name appears before that of the Vijayanagara King Harihara I in a 1349 inscription indicating he gained legitimacy for being a devoted heir of the Hoysalas. 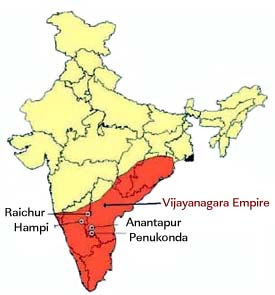 original founding of Vijayanagara was in 1320 by Veera Ballala III, then known as Vijayavirupaksha Hosapattana. By 1344, the transfer of power from the Hoysala Empire to the emerging Vijayanagara empire seems to have been gradual and without bloodshed, as ex-Hoysala officers melted away from a crumbling Hoysala power now to support the Sangama cause. In 1346, Harihara I made a grant to Bharati Tirtha in the presence of Krishnayitayi, queen of Hoysala Veera Ballala III, who herself made a grant on the same day. Harihara I was a commander in the Hoysala Kingdom and had been appointed by Veera Ballala III with autonomous powers after the fall of the Seuna and Kampili kingdoms, to administer the northern territories. The very first fortress Harihara I built was the fort at Barakuru in coastal Karnataka in 1336, when he was a Hoysala commander in charge of its northern territories from his seat in Gutti, modern Ananthapur district in Andhra Pradesh, at that time a Hoysala territory. He assumed the Kannada titles Purvapaschima Samudradhishvara (Master of eastern and western and occeans), Arirayavibhada (fire to the enemy kings) and Bhashegetappuvarayaraganda (punisher of the ruler who failed to keep a promise). 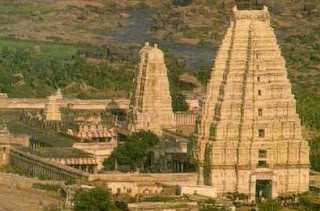 It has been pointed out that even famous Telugu scholars Vallabharaya and Srinatha, in their works called the Sangama brothers Karnata Kshitinatha, indicating they were a Kannada family. An early inscription of Harihara II called him , Lion to the scent elephant of the Andhra king, demonstrating their anti-Telugu propensity. Persian author Ferishta of Vijayanagara days wrote the emperors as "Roies of Karnataka". The Kannada writings of that time Chikkadevaraya Vamshavali and Keladinripa Vijayam state that the Sangama brothers were Kuruba by caste making them people of Karnataka. Almost half of the Vijayanagar inscriptions are in Kannada out of a total of about 7000 available today and use surnames which are pure Kannada titles such as Bhashegetappuva - rayara - ganda, Moorurayaraganda and Arirayadatta. The remaining inscriptions are in Sanskrit, Telugu and Tamil. 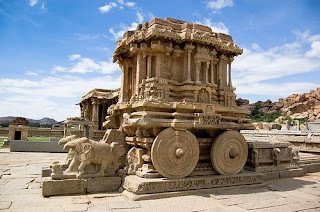 The Karnataka Empire or Vijayanagar Empire was originally of the Karnataka region and it drew its inspirations from the Hoysala Empire and the Western Ganga Dynasty of the Karnataka. Inscriptional evidence shows that Ballappa Dandanayaka, a nephew of Hoysala Veera Ballala III was married to a daughter of Harihara I, the founder of the empire. This is claimed proof enough of the association Sangama brothers had with the Hoysala family. It is also asserted that the theory of capture of Harihara I and Bukka Raya I by the Sultan of Delhi and conversion to Islam is false and that the testimony of epigraphs proves that the area around Hampi constituted their homeland. The empire never had a Telugu origin. The patron saint of the early kings was saint Vidyaranya, the 12th Shankaracharya of Sringeri in Karnataka and this is proof enough of their unquestionable identity with the Kannada country. Sangama brothers even signed their Sanskrit records in Kannada as Srivirupaksha and used their Kannada titles even in Telugu, Tamil and Sanskrit records. No such Telugu titles were used by them. while on a visit to Beidur in Mysore (Karnataka) in 1801, was shown by one Ramappa Varmika a Sanskrit book in his possession called the Vidyaranya Sikka, which mentioned that the founders of Vijayanagar were Harihara and Bukka, guards of the treasury of the Kakatiya King Prataparudra of Warangal. These young brothers met a spiritual teacher, Vidyaranya, the sage of Sringeri monastery, who guided them to establish the kingdom in 1336 and Harihara was made first king. Robert Sewell concluded that Harihara and Bukka were treasury officers of Golla/Kuruba caste, in the court of Warangal (Kakatiya dynasty). As you can see Robert conclusion is based on hearsay and does not carry any firm evidence. Though controversies over the role of Vidyaranya in the founding of the empire exist, Vidyaranya was an important Sanyasi at the Sringeri order, though not the head of the monastic order until 1380. Vidyaranya Kalajnana (in Sanskrit), Vidyaranya Vrittanta, Rajakalanirnay written by Vidyaranya terms the two as working in gaurds in Kakatiya Tresaury,but it also says they are Kuruba lineage. Kurubas are kannadigas and Kaktiya is Telugu kingdom. And he also say they worked for Chalukyas, Now is the Saint trying to get support of both kannadigas and telugu? Scholars like Prof. K. A. Nilakanta Sastry, Dr. N. Venkataramanayya and B. Surya Narayana Rao are known for anti-kannada roles. Their theory of Telugu and Tamil older than Kannada and both are sister languages is well known. They are proposed that Kannada region spoke tamil before 1oth century. So their comments cannot be taken seriously.